In this episode, Jennifer interviews Owner, Senior Soldering Instructor, designer & fabricator at AugustAxel Jewelry Studio, Christy Sears. Welcome to this week’s episode of Roam Howl. Today Jennifer welcomes Christy Sears to the show. Christy has amazing optimism, spirit and energy and shares herself honestly. 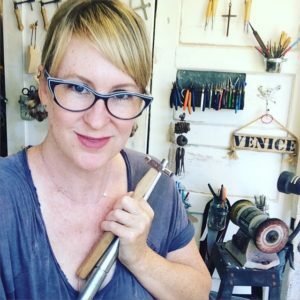 She is inspiring because she has emerged from being a behind the scenes executive in a high powered Los Angeles advertising agency and has become not just a maker of beautiful jewelry but also a teacher. Christy has been in advertising as long as she can remember. When she moved to California, she didn’t know anyone and needed something to take up her free time besides work. She lived close to a bead store and began making some jewelry. Soon after, Christy was introduced to a metalsmithing class at Otis College. Here she got her first torch in her hands and discovered the craft of engaging her hands and her mind at the same time while combining metals. 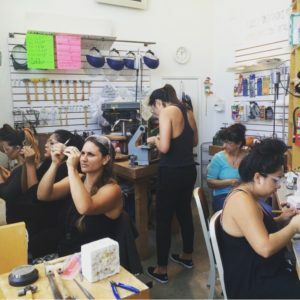 An opportunity arose at a local bead store to teach soldering in Santa Monica, CA. That’s where her teaching path began. Unfortunately the store closed but this led to an amazing opportunity for Chisty. She soon opened a studio of her own where she teaches everything from beginning soldering to stone setting and alternative casting. When Christy was an account manager, she dealt with the clients and had to brief the creatives and keep them on track. She was in more of a management role than a creative role. She felt like the artist in the shadows. She understood what the creatives were saying and doing but she was never one of them. Christy was dissatisfied with this. She wanted to be more involved in the creative aspect but was viewed as just the account manager. This became a struggle to manage egos and not just hers. To hear the rest of Christy’s story about success outside of a cubicle, download and listen to the entire episode: Chirsty Sears – Augustaxel. If you enjoyed the show, please leave a ratings a review on iTunes. I love to hear from my listeners and welcome comments, suggestions and want to connect with you! You will find me at @roamhowl on Facebook, @jenbgardner on Twitter, or you can email me here. I am also on the web at www.jgardnerassociates.com and you can read about my approach to practicing law. If you have any comments and suggestions for future episodes, questions you would like to ask, people you would like Jennifer to interview, find Jennifer Gardner on Twitter @jenbgardner or on Facebook @roamhowl. Email her at roamhowl@gmail.com. Jennifer would love to hear from you! Maybe by listening we will learn something and be inspired to do the next creative, fun without a box thing in our own lives. Thank you for listening, and I hope you enjoy.